Facebook Comments can bring better interactivity into your Blog. These comments will work like a Facebook Wall.This tutorial will help you to easily setup Facebook Commenting on your Blogger Blog. 2. Create a Facebook App To display Facebook Comments on your Blog you should have a Facebook Application. Don’t get worried by the name. You can do that with a few clicks. Modify the below code with the application id copied in step 2. You should create the Facebook Application and the above fb:app_id meta tag should be added to your Blog. Otherwise you won’t be able to manage/moderate your Comments from a single Place(you will have to go to posts one my one and moderate and that too is possible only if you have added the fb:admins open graph meta tag). If you want to alter the width, then you can change 450 to the width that you want. If you want the dark version of Facebook comments, then change light to dark in the above code. (there is a space after the 2008/fbml” )The following screenshot will help you out. Save the Template. This namespace declaration is necessary for all FBML widgets using the fb tag. So if you have already added the namespace declaration while adding some other FB plugin, then you can skip this. If you can’t see it, then it would probably be because you have added some Non-FBML Facebook Plugin. If that is the case, then remove it and add the FBML versions of those widgets. All Facebook Plugins Provided here use the FBML markup(at the time of writing). Check the “Other Login Providers” (Yahoo AOL and Hotmail)option and Save the settings if you want non-Facebook users to leave comments. If I put this on my blog, is there any notifications in Blogger that telling me th new comments comes? It's awesome brother....and you too... you create awesome widgets for blogger...keep it up! 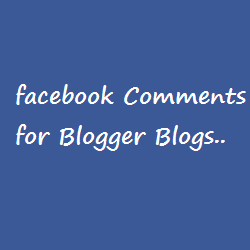 Will the comments posted via Facebook be in sync with Blogger comments ? I tried it.The comment box did not show.Apart from this everything (the posts)has disappeared from my blog.Please help. This is awesome. Thank you. When I implemented I received this error at the bottom of each post: "Warning: http://www.burningdervish.com/2011/09/curtis-fuller-imagination.html is unreachable." @Shubham NeO ©® - No easy way to get it to sync as with Disqus.Facebook to Blogger Export is possible(Facebook has the graph API which will help in exporting comments). But i don't see a way to make the reverse happen. And by the way FB doesn't allow Anonymous(Name/URL) comments..
@LP - You gave your Facebook Page's ID as your Facebook Profile ID. You should be using your Profile ID and not your Fan Page's ID. POST LOOP? How do i do this? please help me to add a comment count. my blog is www.cinema.tv.br. please help. THANK YOU. THANK YOU ! it worked! actually it didn't. the count is still not showing, only the word "comentarios"
Ok. that worked, but how do I make that a link to the comments ? Second, there is some delay on the share buttons being active with the new plugin. They at times are not clickable or take a tremendous amount of time to load, any suggestions? @S.C - It won't be a good idea to display the comments everywhere.You can do it if you remove the first and the last line of code mentioned in Step 3. The better way to do it would be to show a comment link(with comment count) on all pages. The code is there to the end of the post. You haven't created a Facebook App or added the FB Application Meta Tag to your Template. you will still be able to use FB comments and you will be able to moderate them by going to individual posts. Does it help to get more visitors also?as compared to normal comments?Just curious..
i'll ask again since my comment didn't seem to post yesterday. does the comments section for each post sync and appear as a comment on the FB posting? Or are the comments on the blog separate? @Beben - if you don't specify the APP ID, you won't be able to moderate the comments from a single place.If you don't specify the APP ID and you don't have the fb:admins meta tag added, then no one would be able to moderate the comments(but yea you will get the comment form). So if you are not using the Facebook APP ID, you should at least use the fb:admins open graph meta tag. Thanks for the feedback, so can you tell me how to do this part of your instructions? I'm lost and would appreciate it! "You should create the Facebook Application and the above fb:app_id meta tag should be added to your Blog. Otherwise you won’t be able to manage/moderate your Comments from a single Place(you will have to go to posts one my one and moderate and that too is possible only if you have added the fb:admins open graph meta tag)." still no response, that's lovely. from what i can gather, the comments on the blog post are completely different from comments on any FB post that may be automatically generated from the blog post (i.e. Networked Blogs), which leads me to think...what's the point of this then? it's just another form of commenting like Disqus. The FB portion of it seems to have nothing to do with the actual FB website. Where are these posts going? I'm stuck, I've tried a couple of times to make this work but absolutely nothing is happening. I've made the app on facebook, I think my html is wrong? @CHROMEWAVES RADIO - yup its just another commenting option like disqus. Disqus allows you to sync with blogger comments, whereas FB doesn't..
oh i've just realised it works on the individual posts not on the main blog page, thanks! how do I get a new post to appear on my facebook news feed so tha people can comment? or will this happen automatically? also, am i right in thinking that each post will have it's own comments? as in, the comments won't appear on every blog entry? each post will have it's own set of comments.The posts are local to your blog. If the commenter checks the "Post to Facebook" button, it will be posted on to his wall. Thank you Aneesh, You are perfect, Please Tell me Cab I show blogger comments again now!! @Admin - you mean both the blogger and facebook comments at the same time? how much time it will take?or did i mess up somewhere? Post your Blog address and i can try helping you. Hi thanks for the nice tutorial, however I am stack... could you give me some advice? The comments plugin requires an href parameter. error message. @Xen - did you check the "Expand Widget Templates" check box? Help me! Its not working. I just going to start with my blog soon. we can only comment from the post page!!! if some one comes to my home page..he cannot comment.who will tell him to click on the post title..go to the post page..and then comment? ok...got the comment loop...thankx a lot...wohoo! i have tried to add the fb comments to my post..... n i observe that even if the person comments on individual post, the same comments appears for all posts .... Is there a way to make it individual comment for individual post ? ? ? @Testing Friend - i guess you would have tried using the Code provided on the FB plugin page. The code here is adjusted so that it uses dynamic post urls in the href field of the fb:comments tag. You can see the result on the demo blog.It has different set of comments for each post. I tried removing this from my site but I can't bring back the normal comment box. Do you see anything wrong with the code? I just added the facebook comment in my blog. great tips really I used the dark color. I ask one thing, is ther other way when I can still see other comments aside from the facebook comments. I can no longer see my post comments since I changed it to facebook comment. Thanks..nice tutorial..I am loooking for this tut to add in my blog..more power..
it works!! Thanks a lot.. The comment box isn't appearing in my blog, and I followed every step. I'm using a edited version of the Simple Theme. Anyone has an idea of why it isn't working? (Feel free to see my source code). can you please help me out buddy. i tried to integrate it but it doesnt work at all. I used your page to add the plugin before and it worked brilliantly but after a redesign I lost your page and tried other and none of them worked! I'm glad I found your page again it works really well! Deepest thanks. This is so cool. @Eric Olsen - Add the code first. Then only i will be able to help you out :) You have not done steps 4 and 5. @tayyab - its already working on your blog. Hi. I followed your instructions on my brand new blog today. I'm not sure where I went wrong...I now display the facebook comment box AND the blogspot comment box. I want to only display the facebook one. I checked "hide" on the comments option on the page and when I did, it also hid the facebook box too. Do you have any help when adding the Facebook login button! it was working but now it doesn't seem to be! you are wonderful! (i promise i DID do steps 4 and 5 before i asked for help - not sure why they didn't save through the first time) looks like everything's up and running now. Now, you don't happen to know if there's any way to sync this comment feed on the blog with the comment feed on Facebook itself if I'm using a tool like Networked Blogs to automatically post these? Now, THAT would be amazing. I have tried to install this at least 20 times using other blog posts and could never get it to work. FINALLY, your article helped me get it right!! THANK YOU! So, it's me again and it's not working yet (and I tried different codes from other websites). Does this comment box work with layouts from the template editor? Thank you... Is there a way to get the FB comment box to show up on the home page of the blog...so that some one does not have to click on the post in order to comment? I realize this is not best/common practice for a blog but for my purposes it is important. Thanks...!!! its awesome i have done it.. m so happy. I've went through all the steps but it's not working. I do not get notified when someone comments... any other way? and can u please show some snapshots of your'Comment Moderation Tool' page?? and, can u tell me how fb:admins work?? You enter facebook.com/yourusername, or yourusername or http://facebook.com/yourusername?? or something totally different!? You gave your Facebook Page's ID as your Facebook Profile ID. You should be using your Profile ID and not your Fan Page's ID. Sorry for the long question but I would really appreciate any help. @Nelson O'Neil Rios - i guess your template has multiple occurrences of data:post.body. Try pasting the code below the second one. @bcrvideo - you can give wackyyoutube.com as the app domain and http://www.wackyyoutube.com as the Site URL. I appreciate your help. It works perfect! This is exactly what I would love to ad to my blog. I follow the steps but there is absolutely no comment box now in my blog. Is there any chance to figoure out what did I do wrong? i have a ques.. can v make a message box which can directly send a msg to our cell phone IN BLOGGER. is there a way to make sure that the fb comment box appears only for my last post and future ones. I would like to avoid to have my past 130 posts staring with zero fb comments. hey, thankz.. i've done it..
How do i fix this? contact me through my website! wich one i could use ??? Can you help me detect the problem ?? please !! what about i found two in my template? where i should paste the code? Thanks for the tips! - How I could add few blank lines at the top of the fb comment box in order to separate it from other information above? I implemented your code in my site, but unable to moderate it. The fascinating thing is that these comments doesn't show in Comment Moderation Tool. Also the comments doesn't appear in chronological order. Please check it. Hoping for a updated post on fb comments. Last Comment i posted was send for approval. Please don't approve my comment as i am able to post,view and moderate comments. Anyway thanks a lot. I'm just a new guy to blogger but I've done everything in the tutorial, very well. But it doesn't show any facebook comments bar below my posts and I know that the problem is with this non-FBML thing, but I know nothing about this FBML!!! is my blogger URL, Please help me!!!! However, when I check the box "Post to facebook", it doesn't post anything on my FB wall... It seems to be true not only with MY blog, but also on another blog I've found using the FB comments. Nothing gets posted on my wall, that's too bad. Any idea why? Thanks! But I'm having a bit of trouble figuring out how to get the comment count to work. I just cant figure out what you mean by "post loop" and where the code is suppose to be glued in. Already done! Thank you very much! Thank you so much!! Works peferctly! Doesn't work for me - triple checked. Thank you ! Awesome, it works perfectly. Very convenient for the blog. If you are going to embed it into your blog, do not forget to save the link to the list of comments. Only downside I see is the comments management/notification process. i tried on my blog, it worked on my old template, bt noton new template! i cant find the codes in step 4..
Now I can't use anymore the tab Layout inside blogger. How could I fix this? I've got it working but is there a way to have the comment box open all the time without having to click the count comments button? I'm also new guy to blogger but I've done everything in the tutorial,But it doesn't show any fb comments bar below my posts and I know that the problem is with this non-FBML thing, but I know nothing about this FBML!!! @AmiT - you missed steps 4 and 5 or did them wrongly. Hey Blogger thanks for the instructions. Working like a charm. It might be good to tell folks in your post that it won't appear on the home page. I tried several more times to link it up before I realized that it was working already on the post specific pages. it works ,thank you so much ! I'm using blogger custom domain, so what i fill in App Domain and Website domain field. Please help me out. !! Thanks in advance !! How did many of the referenced blogs above get the comments to appear on their front page rather than just the individual posts? @PhilTron - i don't think it is cool to put the the comments on home page and other index type pages. It will slow down your pages and make them bulky. But if you insist, then you can get it by removing the 2 red lines from the code in step 4. Hi, I've got the facebook comments set up on my blog however when people leave comments they appear on all blog posts instead of just the intended on. How do I fix this? I DID! Hahaha! Oops. Thanks! Cause when I visit my home page, the comments box doesn't show per post. :( It's only visible when people click on individual posts? May I know how to allow anonymous comment on fb comment box ?? I had add fb comment box to my blog ?? But, I want to change it back ?? How to change back ?? it's great...i like it...but, i'd like to place the fb comment on below blogger standard comment, do you know the trick to place fb comment on below blogger comment? it's great, i like it, really i am...but, i'd like to place the fb comment on between blogger comment form and blogger comment, it will look better... do you know the trick how to place fb comment between blogger comment form and blogger comment? Can you tell me how to add Facebook comments to my Blogger static pages?? in the code mentioned in the post. Thank you, but that didn't work for me. It allowed blogger's comment system on static pages and added Facebook comments to my home page. I'm going to try and use Blogger's new threaded comments. Thanks so much for your work and this plug in. Quick questions: Is there a way to turn off comments on certain posts? For instance, when a contest deadline is over, can the posts be turned off yet still show those that posted? If not, can the code be added to the post template (to each post separately) instead of in the blog template? How would that work? FYI, I couldn't get the comment loop to work for the app to show on the main page. how can i change its position to below my linkwithin widget? now the fb comment is above my linkwithin widget.. can you teach me how? Where can I view and moderate all the comments? Thanks in advance! But I cannot edit global settings or moderation mode! It say's I don't have fb:app_id ! Though I created the app and also added the tag! another question though vat about FB 'like' button? Sorry for the taking your time again. Facebook comments are perfectly works in my blog. Thank you so much!!! Can you please do me a favour. I want to receive the notifications in this application developer facebook profile( i.e. in my facebook profile) when someone left comment and i want to make a heading like "Comment Via Facebook" at the top of the "fb comment plugin" of my blog. Please Blogger Plugins HELP ME...!!!! It's not working for me. Did everything above. @Andre - Go to your post page and you will see the comments there. Oh yes i can see it now, but i have to enter the post. I would hope it to appear below each post on the main page. Is it possible? Thank you. Ok, i've changed the parameter "item" to "index" and now it shows in main page but not in post page. Can i get it to show on both? @Andre - it's possible to make it appear everywhere but i won't recommend that. You can have around 20 posts per page(check your lavel page) and a comment form for each of the post will make the page bulky.Instead you can add a link to the comment form on the main page(The last part of the tutorial will help you with that).. If you still want to have it everywhere then you will have to remove those 2 red lines of code. Again, comments moderation and global settings are not working! It say's I don't have fb:app_id ! Please help me BloggerPlugins to receive notification in my fb profile, when somebody leave comment !!! hey i am not very sure but it seems like some of the blogposts are not showing the moderator tab. sometimes moderator tabs are shown but when i comment on it using another profile, the tab (moderator tab) vanishes? help me out on it. Awesome! I was able to make it work on my blog. One question though, is it not possible to display the past comments I had before the FB comments for blogger was added? @Nishant - How else would you think it should work? Everyone can't moderate the comments. Only the one who owns the FB app can. If you want to give moderation villages to more FB users , add them to the Facebook app that you have created.